For anyone with even the most passing interest in personal fitness, a running belt has become an almost indispensable piece of kit. Certainly when you consider the huge number of gadgets we carry around on a daily basis – I-phones and I-pods, watches and wallets – it is hardly surprising that gym-goers require somewhere roomier than mere pockets whilst working up a sweat. But with the plethora of options currently vying for attention on the market – each new brand promising the perfect combination of comfort and security – it can be difficult to know how our money might best be spent. With this handy guide however, we will steer you through everything you need to know before parting with your hard-earned cash. Why Do I Need A Running Belt? For the most avid of joggers, the benefits of a running belt are obvious. They offer a place to keep all those exercise-time necessities such as supplements and water-bottles, their presence having become almost non-negotiable for anyone series about their personal fitness. But even for the more casual of gym-goer (or those just taking their first tentative steps towards better health), an exercise belt can ensure our valuables are kept secure whilst simultaneously guaranteeing your workout is not encumbering by jangling keys or the perpetual prod of an I-phone. Certainly, with our daily lives ever more dependent upon all manner of technology, it is important that we can keep these gadgets close at hand during exercise, all the while maintaining peace of mind that a good exercise belt can afford. This particular style of belt is interesting in the respect that it does have any pockets in the typical sense but rather one singular compartment that wraps entirely around your body. Because of this simplicity, it is typically sleeker in appearance that many of the other designs while it’s the stretchy material provides the security of a close-fitting belt although never feels restricting. The Flipbelt is perhaps the most popular tubular design currently on the market with many more brands adopting this minimalist new style. This is the more traditional belt design that most fitness aficionados will already be familiar with. It relies on zippers and buckles to hold your valuables in place, an approach that grants confidence at the expense of aesthetics. In the past, this style of belt was plagued with problems in so much as that it was not tight-fitting enough to offer security to the wearer, often falling down beneath the waistline. Thankfully now however these problems have been largely rectified and they now represent some of the premier belts on the market such as Camden Gear and Giosport. 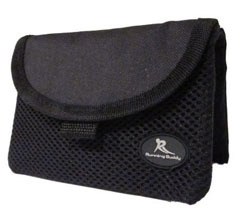 Although not a belt in the typical sense of the work, the pouch design instead attaches onto another belt, armband or indeed any other item of clothing. These tend to be roomier than the other designs but in turn but sacrifice comfort in the process. If this is the style of product that interests you, Running Buddy represents perhaps the most respected brand currently available. In addition to considering what style of running belt you require, it is necessary also to decide how much money you are willing to part with. Although there are a huge number of manufacturers out there offering a seemingly limitless range of exercise belts, these can broadly be broken down into three price categories. In the elite category of running belt, you have some of the industry’s most recognisable names. These manufacturers have been consistently responsible for producing top quality designs for years and certainly in the case of the three mentioned – FlipBelt, Fitletic and Amphipod – you can be assured you are in possession of a quality piece of equipment. These brands offer a superior exercising experience, namely security, storage space and most importantly comfort whilst in use. Certainly, forthe most serious or perhaps even daily joggers, it might be worth forking out this little extra expense as the superior quality material of these products means that this could be the last running belt you ever need buy. As a general rule, $20-25 acts as a fairly reliable marker when it comes to the exercise belt middle-ground. For this price, you can expect a product to perform all the functions you would expect but perhaps with less of the flair of the brands of the upper-end of the price spectrum. Above Elite and Running Buddy in particular receive consistently reputable reviews from users while Nathan and Camden Gear cannot be overlooked. But with just a little shopping around however, you can find a very reliable product in this price range and one certainly that would be acceptable to all but the most particular of joggers. For those of you who are more economically-minded or perhaps purchasing your first running belt, it may be worthwhile considering one of the cheaper options. These more basic brands perform largely the same function as their more expensive counterparts although often at the expense of comfort, the zippers and buckles the employ often cited as a source of chaffing. These running belts are typically not as tight-fitting and tend to be quite conspicuous and bulky when running. For the newbie however, this more modest alternative may be perfectly suitable for your needs. How Do I Choose A Running Belt? Besides cost however, there are several other factors to bear in mind when shopping for an exercise belt. What do you plan to store in it? What size, realistically, will be comfortable for you? How regularly do you plan to use it? Although each customer will have their own individual requirements from their running belt, there are five areas that everyone should consider. Without doubt one of the biggest considerations you will have to make as to how much room you will require. For some, perhaps you will need little more than somewhere to store your asthma inhaler while technophiles may be looking for something big enough to accommodate all manner of gadgetry. Most of the major manufacturers endeavour to produce a belt that is roomy enough to store items as large as an I-phone 6 but if your needs are not quite so great, it might be worthwhile considering a cheaper, smaller alternative. No matter what your price range however, one aspect of an exercise belt that cannot be compromised is comfort. Tubular designs tend to offer the tightest fit but for those of a more rotund figure, these can prove restricting. Many product including the Amphipod and Flipbelt can expand up to four times their original size and offer a secure fit for almost anyone. If possible, try on your exercise belt in-store or if purchasing online, visit the company’s official site to get an accurate assessment of the size you need. Although not everyone will be particular concerned with the aesthetics of their running belt, there are a group of gym-goers for whom style is very important. On this front, once again, the tubular design succeeds in looking sleek and minimalistic whilst for those who really want to put their own stamp on their belt, SPI offers an unrivalled range of colours and styles. As with any purchase, quality is a foremost concern. As the running belt market has grown more competitive, manufacturers have sought to outdo their competitors and are now forced to employ only the best materials; breathable lycra and ultra-thin mesh. On this front, several brands of distinguished themselves, most notably Flipbelt, Amphipod and SPI, their attention to detail and superior design ensuring that your running belt with stand the test of time. Whilst each company attempts to product a belt that is problem-free, issues do invariably arise. In this regard, SPI and Running Buddy have proved peerless, always seeking to address their customers’ concerns in the timeliest and most thorough manner, offering replacements as standard if in the unlikely event that a substandard product finds its way to you. Features: One of the most popular exercise belts on the market, the Flipbelt offers a sleek, straightforward new design with four sizeable pockets made out of an entirely sweat resistant material. It also comes in a range of colours, each luminous enough to ensure you remain visible whilst out on a night-time run. Pros: The Flipbelt prides itself on its wear-ability, an area that in which it is almost without compare. It comes in five sizes from 18 inch to 38 inch, its flexile micro-poly and lycra material being able to facilitate most any body type. In the absence of belts buckles and zippers, it is chafe-free while the breathable, machine washable fabric is so lightweight, it goes practically unnoticed. Cons: The need to actually flip the Flipbelt from inside to out each time you wish to retrieve your belongings has irked some users. The Pockets are also horizontally shaped, meaning it can be easy to simply open the pocket and let the contents tumble out. The Verdict: The Flipbelt can seem expensive for what appears to be little more than a stretchy piece of material but already it has become one of the favourites of the industry. A perfect choice for those who are willing to spend a little extra for the benefits of a superior product. Features: With its pouch design, the Running Buddy can be attached to either your belt or armband, a series of magnets holding it perfectly in place. It is one of the most spacious designs on the market, its dri-fit material guaranteeing your valuables are kept well away from moisture, whether that be the elements or perspiration. Pros: The Running Buddy’s magnets can be fixed to any waist-band, a feature which may be appealing to those for whom other exercise belts are not suitable while the water-resistant inner pocket is perfect for keeping expensive gadgetry out of harm’s way. A steal for the price but even if you are not happy, manufacturers offer a 100% satisfaction money back guarantee. Cons: With only two colours available, pink and yellow, the Running Buddy is not the most visually appealing belt on the market. It is also bulkier which means it can be bounce while in use, although this can generally be nullified with a little practice at fixing it in place. The Verdict: Perfect alternative for those who find other belts restrictive whilst offering more space for those who require it. Features: The first thing you notice about the Amphipod is that it is surprisingly small. Don’t be fooled however as it can be stretched up to four times its original size. It boasts a 9 inch x 2 inch compartment that is able to accommodateitems as large as a Galaxy S6 or I-phone 6. It keeps items in place with a very secure zipper and unlike many other brands that make the claim, the Amphipod genuinely does not bounce while you are exercising. Pros: By far and away the most impressive aspect of the Amphipod is the materials from which it is made. The pockets’ ultra-thin mesh allows the air to circulate, meaning neither you nor valuables sweat. The compartments are conveniently separated while the reflective band which is placed at the rear alerts drivers to your presence. Cons: The only significant concern expressed about the Amphipod is the difficulty some female wearers have experienced when they are running, the belt sometimes slipping out of place. This is generally due to females’ wider hips and slimmer waist and generally can be remedied with a little practice. The Verdict: Being both comfortable and secure, the Amphipod gives a secure but non-restricting fit while the pockets offer a great deal of space for all kinds of modern necessity without compromising on comfort. Although some ladies with the quintessential hourglass figure may have to look elsewhere, for everyone else this is a very impressive piece of kit and when you consider the price of the Amphipod, this really is one of the most attractive running belt options out there.